Data supplied to BODC were accompanied by data quality notes from the Originator that detailed observations made when the data were processed and subsequent processing decisions. A summary of these notes is available below for each of the instruments deployed on rigs from this cruise. Sea-Bird MicroCAT 02506 5 m This mooring was deployed on the cruise after PD11_05 (cruise PD12_05), as the Originator was unable to deploy it on PD11_05 due to bad weather. The Originator has converted all data recorded between 2005-04-13 05:20:01 UTC and 2005-04-21 09:40:01 UTC into absent data values because the mooring buoy became adrift and had re-deployed by a chartered CEFAS vessel. Aanderaa RCM 09959 10 m The Originator recommends that the data from this instrument are not used, as the data are of poor quality. Sea-Bird 16+ SEACAT fitted with two Seapoint Turbidity Meters (#10486 and #10489) 04737 Located on seabed No recovery CTD was available for the CTD comparison checks, however the data appear to be of good quality. Teledyne RDI 600 kHz ADCP 2391 Located on seabed To correct for the magnetic declination (difference between magnetic north and true north) latitude values were changed by -4.1464°. All latitude values were modified by +0.91128° to correct for the compass error. Sea-Bird MicroCAT 02081 5 m Comparison checks performed against CTD data revealed consistent offsets in the temperature and conductivity channels. The temperature data was adjusted by -0.0183°C and the conductivity data was changed by 0.0090 S m-1 to correct the data for these offsets. Sea-Bird 16+ SEACAT fitted with Seapoint Turbidity Meter 10471 04597 Located on seabed There was a consistent offset in the temperature channel of 0.01°C, however the Originator felt that it was not necessary to correct for an offset of this size so no adjustments have been made to this channel. Comparisons performed against CTD data found an offset of -0.0045 S m-1 in the conductivity channel. An offset correction of +0.0045 S m-1has been applied to the conductivity data. Teledyne RDI 600 kHz ADCP 3644 Located on seabed To correct for the magnetic declination (difference between magnetic north and true north) latitude values were changed by -4.0482°. All latitude values were modified by -0.61122° to correct for the compass error. 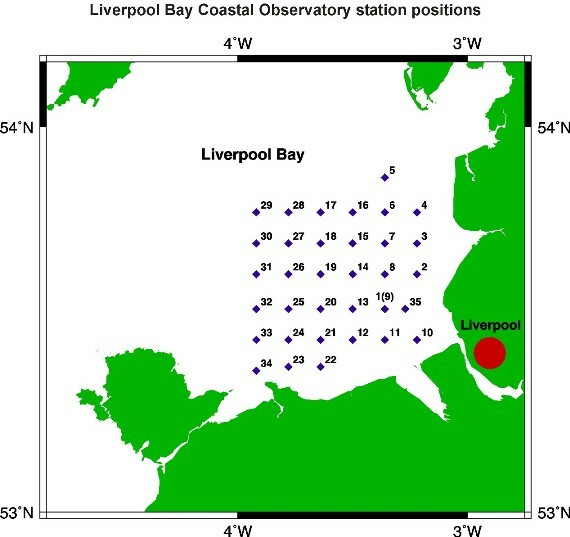 Data were downloaded by the Proudman Oceanographic Laboratory (POL) (since 01 April 2010, the National Oceanography Centre Liverpool (NOCL)) from the instrument logger, and factory calibrations were applied to the temperature and conductivity channels. The instruments are returned to the manufacturer for recalibration approximately every two years. The data were then reformatted by POL/NOCL to a standard ASCII format. The series was marked as 'use with caution', if there were problems which the Originator was unable to correct, or it was unclear whether there was a problem with the data. The SBE 16plus is a high accuracy conductivity and temperature recorder (pressure optional). It is designed for moorings and other long-duration, fixed-site deployments. The SBE 16plus has 6 amplified A/D input channels and conditioned power of 500 ma is avaliable for auxiliary sensors, dissolved oxygen, turbidity, fluorescence, PAR etc. The SBE 16plus is available with a choice of RS-232 or RS-485 interface. The data were provided to BODC in ASCII format, and the series were reformatted into BODC standard internal format using a transfer function. The following table shows how the Originator's variables present in the Seapoint 16plus data were mapped to the appropriate BODC parameter codes. This rig was deployed as part of the Liverpool Bay Coastal Observatory during R.V. Prince Madog cruise PD11_05. Recovery of the rig took place during R.V. Prince Madog cruise PD18_05. This rig is a bottom frame comprising of the following instruments 0.5 m above the seabed; Waves Acoustic Doppler Current Profiler (ADCP) and a Sea-Bird 16plus. The frame (D1) was fitted with two Benthos releases with fizz links and a spooler with 200 m of rope for recovery of the ballast weight. Recovery of the rig took place during R.V. Prince Madog cruise PD18_05. Winds were light, less than 10 knots and variable in direction. Sea surface height Mode 1: 100 pings every 10 minutes (velocity standard deviation 0.007 m s-1). 35 x 1 m bins (2.65 - 36.65 m above the bed) Sound velocity calculated from temperature, depth and salinity of 32. Fitted with a pressure sensor and 512 Mbyte PCMCIA memory; hourly wave recording enabled. Sample interval 600 s; digiquartz integration time 40 s, 1 s delay before sampling, pump on for 0.5 s before sampling. Fitted to base of frame with pumped conductivity sensor underneath. Two SeaPoint turbidity sensors: S/N 10489 taped to roll bar and S/N 10486 in CTD clamp; both set up for 0 - 25 FTU range.